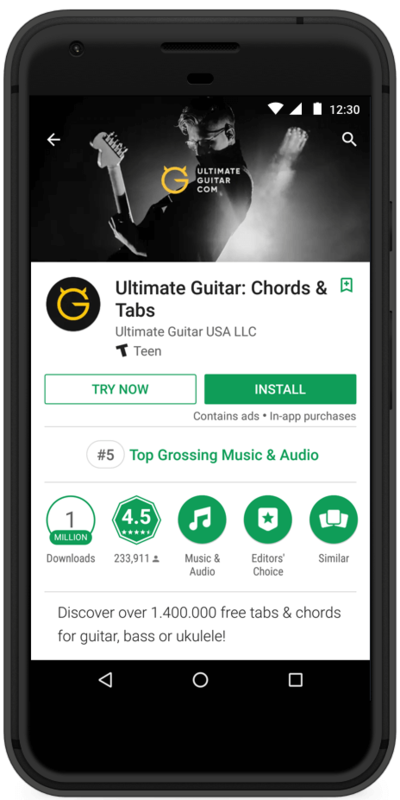 With chords and tabs for over 1.1 million songs, Ultimate Guitar (UG) is one of the fastest growing guitarist communities in the world. It has over 10 million registered users who regularly participate in forums and contribute tabs, lessons, and articles. UG also provides all of the latest music industry news, reviews, and blogs about the inside scoop in music making. Ultimate Guitar has a big fan base of engaged Android users, and they are always looking to reach new people. UG is excited about Google Play Instant and the Try Now feature, as they are confident that increased trials will result in more user growth. Building for Google Play Instant was a straightforward and smooth experience for UG. With React Native's additional library, UG's app was above the 4MB limit requirement. However, having discovered and signed up to Google Play Instant's 10MB program, they were able to publish an instant app. TRY NOW and web banners can also be instantly enabled for any instant app under 10MB. In less than two weeks in total, they planned and designed their instant app, including a week spent developing and testing it, before rolling it out on the release track. With the implementation of TRY NOW, UG saw an immediate increase in people trying their app. ~20% of those who tried the app through the TRY NOW button went on to install their app. This led to a remarkable increase in installs of 8%, after just a week of development time. Following these strong results, UG continued to invest in its instant app, improving user data tracking, building better user onboarding, and focusing on monetization. "Google gives us a great opportunity to increase the app's audience with the instant app feature. This is a simple way to provide users with high-quality content without asking them to put in a lot of effort." All app and game developers can build instant apps. Get started today!